One of the top things to do while in Ladakh is to go trekking in the Himalayas. Ladakh means “Land of High Passes” – these high passes with valleys and mountain ranges provide great options for trekking routes. 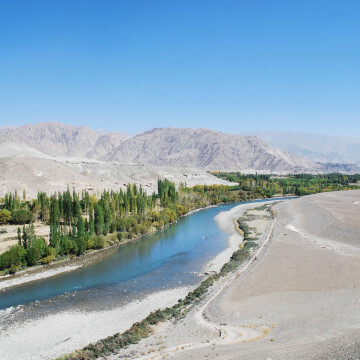 Trekking in Ladakh is also the only way to truly experience the wilderness of the high altitude desert environment, giving travellers an opportunity to visit remote villages with no motor vehicle access as well as a chance to spot the wildlife. On this experience we take you on a 3 day Trek through the Hemis National Park, which is one of the largest protected national parks in India and the only one north of the Himalayas. The park is home to numerous endangered species including the snow leopard, with only around 200 of them believed to be in the park. The Snow Leopard is the apex predator here and hunts species including the urial (Ladakhi goat), argali (the great Tibetan sheep), bharal (blue sheep) and other livestock. Other animals in the park are the red fox, Tibetan wolf, dhole (wild dog), lynx, marmot and mountain hare. We have set aside one day to explore the areas around Rumbak village in order to spot wildlife. While sighting the elusive snow leopard is rare, however you are likely to see other animal species during your time in the Hemis park! The trek route difficulty level is considered as moderate. We will be starting from Zinchen and camping near Rumbak Village for 2 nights, the final day is the most challenging part of the trek when we climb from Rumbak (4000 mts) to Stok La (4800 mts) and then descend to Stok Village. The extra day at Rumbak will be for exploring the area to spot wildlife, with the evening spent interacting with the villagers and having dinner with them. We leave Leh by 9.00 AM and after a short drive we will reach the starting point of our trek at Phey bridge. Here you will meet your guide, when you will be briefed about safety and do’s and don’ts. All the participants are handed a packed lunch box consisting of vegetable sandwiches, boiled eggs, fruits, chocolate bars and bottles of water to carry in their personal backpacks. The rest of the luggage including your bags, tents and supplies are carried on mules. The crew climbing with you includes your guide, a cook and a mule caretaker, all of whom are locals with necessary knowledge and training. The first two hours are a gradual ascent on a winding path along the Indus river, after another 30 minutes we will reach Zinchen village. After a brief stop, we proceed into Zinchen gorge which gets narrower and rugged as we keep walking. 2 -3 hours later the valley opens up to Rumbak village with backdrop of beautiful snow capped Stok mountains. We will walk through the village and camp at a location just above the village. At the campsite warm food is available anytime you want. Dinner will be prepared and served inside tents. Rumbak and its surrounding areas are home to the elusive snow leopard and a variety of other animals. Today we will go on excursions to spot some of the wildlife in the region with a local. In the evening we will head to the village and take a walking tour. You will get an opportunity to mingle and interact with villagers over dinner. Today there is a lot of ground to cover, with the most challenging climb on this trek. We will start the ascent to Stok La after breakfast. The trail up to the base of Stok La (4800m) starts fairly gradually but becomes steeper as we approach the pass. At the pass, we will have the opportunity to absorb the stunning views of the Indus valley and remarkable colorful rock formations around us. From the pass, we descend along the mountainside up and down until we reach some stone houses at the village Mankarmo (4,000m). After a brief rest, we will start descending to Stok village through a narrow valley full of beautiful rock patterns. From Stok village we will drive back to Leh. Bring your own sleeping bag, all other equipment required for the trek will be provided by us. If you don't own one then you can rent one from Leh. Carry a small backpack with you, this will be useful to carry essentials like water and food on you while you trek.